Did you ever visit the city of Klaipeda in Lithuania? If not you definitely should! Beside other attractions there is a café famous for its sensational variety of pastries. The “Sugar Studio” belongs to Ramunė Budrikienė (43). She regularly comes for dialysis in our Klaipeda kidney centre since 2008 but all health issues could not stop her from becoming a successful business woman and making her dreams come true. Ramunė´s success story did not just come by itself. The mother of two sons had a long history of health challenges before starting dialysis. It all began with an autoimmune disease when she was just 18 years old. In order to stop her immune system from attacking her own body she received various drugs that over the years caused blood cancer. Ramunė won the fight against the cancer but time and again had to face new blood infections. After she had spent more than one year in hospital, she felt so exhausted she almost could not walk. As a consequence of her diseases, her kidneys failed and in 2008 she had to start dialysis. Nevertheless, Ramunė did not give up but always trusted to overcome all challenges even if doctors claimed the opposite. Could it be that the secret of her strength lies somewhere in her pastries? Hi Ramunė, nice to talk to you! Your sweet baked goods have reached quite some prominence. What gave you the idea for the “Sugar Studio”? It simply happened that way. It all started with a cake, which I made for my mother’s 60th birthday. Both the look and the taste were very well received by our family so I started to make cakes also for other occasions and found out that I have a talent for it. The funny thing is that of course the taste is important but I like the creative part the most. This year, the “Sugar Studio” will celebrate its 6th anniversary. 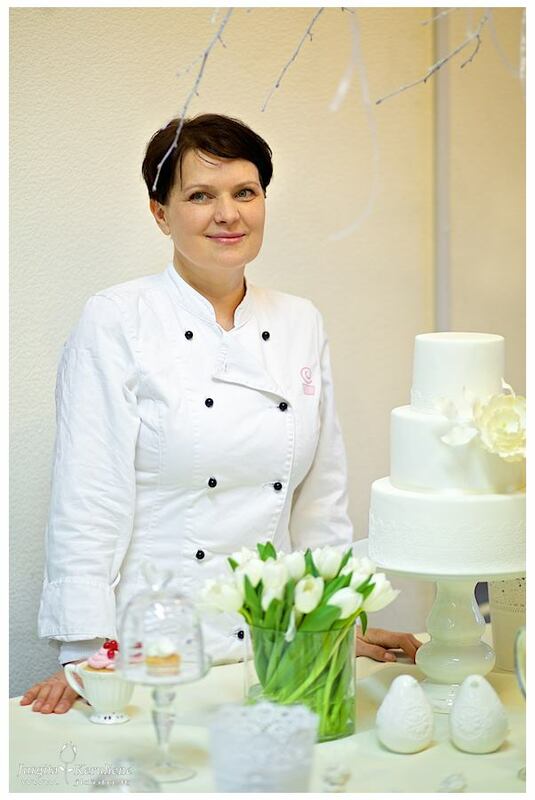 Since then, the selection has increased a lot and it has become one of the main patisseries in Klaipeda. People like our cakes because they are all handmade and authentic. You can really see that we spend a lot of time to decorate the cakes. In the beginning we only produced cakes for weddings, christenings, corporate events or birthday parties depending on the season. Later, the idea came up to open a café and it happened to have the same name “Sugar Studio”. It worked out well and I am happy to say that today we already have four employees. We constantly try to grow our customer base and everyone comes to us to celebrate every new milestone! There is this current trend of dessert boutiques. Do you feel a strong competition in Klaipeda? Sure, there is a strong competition. Many dessert shops do similar things than we do but for example they have no tarts in their selection which is something we are famous for. There are also a lot of people selling cakes made in their home kitchens. I try to keep up with the innovations and ideas, my aim is to offer new and interesting creations. How do you manage to combine your business and dialysis? The dialysis treatment is of vital importance for me so I go there every other day. Still, it is kind of a lost time. After the treatment I immediately go to work. Over the years I got used to dialysis and also other necessary treatments, so I cannot complain. Where do you get the strength for all your projects? The most important thing for me is my family. I am a fighter and I know they are worth the fight. My older son Giedrius is nearly grown up and currently studying in Copenhagen. His younger brother Donatas attends the high school in Klaipeda and lives with us. My men are always on my side, we went through all difficulties together and they never complained. I am very grateful to have them. What advice would you give to those patients who say that starting dialysis means the end of an independent life? I understand these people and I think that if a person has no goal or dream in his life, it can be difficult. It is not easy to find this meaning in life. However, I found it, and I am very happy despite being a dialysis patient. I am active, I like to be outdoors and I really get restless if I have nothing to do. I managed to build up my own business despite my health problems. I found that special something that gives me energy. After all the challenges I have been facing in life so far, I know that self-pity is the worst thing you can have. You can be sorry for yourself and complain all the time, but it does not change anything. Thank you for the interview, Ramunė! I believe that your story will inspire many of our patients and staff. We wish you all the best and success in business and in life! Please find Ramunė and the “Sugar Studio” online on her Facebook page and her website.